2) Now imagine The Pogues singing the theme, Shane MacGowan slurring all the lyrics, to The Brady Bunch. I apologize if you can't get those out of your head all day. The point is, I'm a fan of TV themes, even, in a weird way, the bad ones. I think about them way too much. But here a bunch of theme songs -- from shows that mostly were flops -- that still haunt my nightmares. 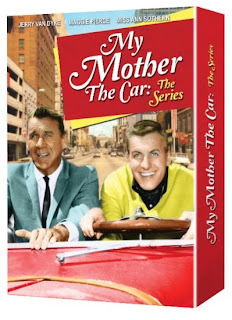 First, I give you My Mother the Car, a Jerry Van Dyke vehicle (pun intended) that ran on NBC from late 1965 through the spring of 1966. Many years ago, George R.R. Martin (sorry for the gratuitous name-dropping) made me laugh out loud when he said that that the funniest thing about My Mother the Car was that serious men with briefcases and expensive suits at NBC had to have had several intense meetings to develop this show. The entire premise of this clunker is explained in the theme song. Phyllis (1975-77) has the distinction of being the worst of the Mary Tyler Moore Show spin-offs. (Hey, I liked Lou Grant!) The opening theme actually was kind of clever. But still ... Phyllis. The mid '60s hit series Batman had one of the coolest theme songs in TV history. Written by Neal Hefti, this instrumental was covered by The Ventures and even Iggy Pop, who did a live version. But that makes the theme song of Batman's far-less successful spin- off Batgirl even more deplorable. For one thing, they gave it lyrics -- lyrics like "Are you a chick who fell in from outer space? Or are you real with a tender warm embrace?" Holy crap on a cracker, Batman! Besides Batgirl, Batman's success, inspired other superhero shows on network TV. NBC's answer was a bad comedy called Captain Nice. At least Batgirl was easier to look at than this mercifully short-lived series. And the theme song was nearly as terrible. F Troop's stereotypical treatment of Native Americans would never fly today. Just ask Adam Sandler. Of course the only people dumber than the Hekawi tribe, for the most part, are the white soldiers at Fort Courage. I have to admit, I kind of liked this show when I was a kid. It was better than My Mother the Car anyway. Still, the mock-heroic theme song from the first season is pretty clunky. And yes, the theme song sucked. "New dreams and better scenes/ And best of all I don't pay property tax," the show's leading man, Greg Evigan sang. I don't know, but I think even Grover Norquist would rather pay property tax than to be stuck in the cab of a truck with a damned chimpanzee day in and day out. The song loses even more points when you compare it with the theme of an earlier NBC truck-drivin' comedy Movin' On, -- which was written and sung by Merle Haggard. All parents make mistakes, but I can proudly say that I never inflicted Lamb Chop's Play-Along (PBS, 1992-97) on either of my children. But I must admit, the theme song is a showcase for one of the pioneers of Caucasian hip-hop: Shari Lewis. And I agree with this next one. Eight IS enough of these horrible tunes. But may you spend your Wacky Wednesday like a bright and shiny new dime!